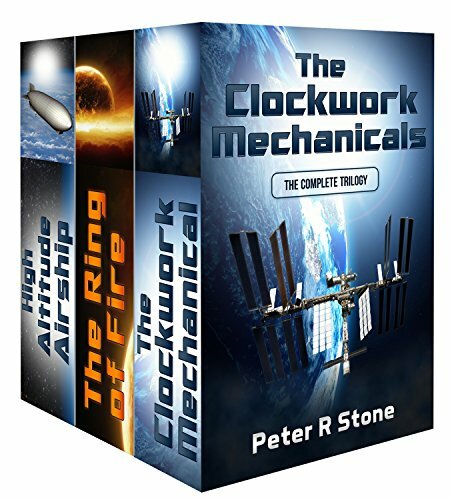 Clockwork Mechanicals - the Complete Trilogy - a middle grades book for one low price. Includes: The Clockwork Mechanical, The Ring of Fire, High Altitude Airship I wake up. The thing is, I'm not in a bed or on the floor beside the bed or on a sofa or even in a car. I'm lying on a white floor made of metal that is bruising my elbow, shoulder and hip. Sunlight is streaming into the room through a small round window. Okay, it's not a window. It's a porthole, like you would find on a spaceship. I peek through the porthole and I gasp in shock, because I realise I'm not on the earth but in space! The funny thing is, I have no idea where I am or how I got here. Worse, I don't remember who I am. My thinking is interrupted by strange sounds coming from the passageway on my right. I can hear large gears meshing together and the thump and scrape of metal upon metal. I'm afraid to look and find out what's making such terrible sounds, but I look anyway. And then I squeal with fright because there is a monstrous machine standing there that looks like it came from my worst nightmares.